Georg Ritter von Trapp was born on April 4th, 1880, in Zara (now Zadar), Croatia, then still part of the Austrian-Hungarian Empire. His father was a navy captain. He wanted to embark on a navy career as well and attended the Royal Naval Academy in Fiume (now Rijeka). In 1910, he met Agathe Whitehead at a ball. It was love at the first sight and their marriage a society event. While still a young navy captain, the command of the submarine "U6" was assigned to him. During World War One, the French submarine "Leon Gambetta" was sunk by Trapp's mission. 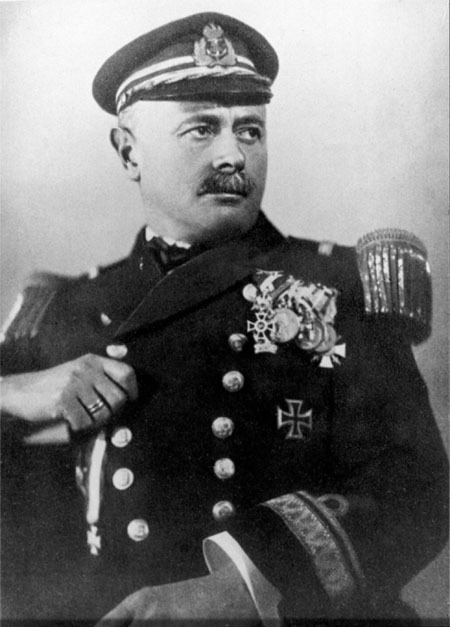 In 1916, he was promoted to lieutenant commander by Emperor Franz Josef I. After the war, Austria no longer had a coast and did not need a navy, Captain Trapp not only lost his post, but also his wife. Lady Whitehead died in 1924 and left him alone with seven children to look after. On November 26th 1927 he married Maria Kutschera, who was the governess for the captain's children before. In 1938, Austria was annexed to Adolf Hitler's German Empire and Captain Trapp was offered a high position in its navy. "I have sworn my oath of loyalty to only one Emperor" was his answer he rejected. In 1947 Georg von Trapped passed away.